There were SO many potential overland platforms launched this week in Detroit at the North American International Auto Show, and some forthcoming vehicles that we found out a lot more about. You’ll see these new vehicles hit showrooms over the next year. There are a few updated light-duty trucks with diesel engine options, a new mid-size truck, a couple of small SUVs, and a full redesign of an iconic overland vehicle. 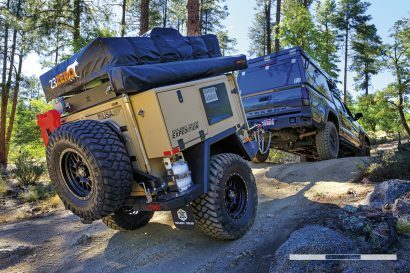 Would you take any of these new vehicles on an extended overland adventure? Will one of these rigs find its way into your driveway? 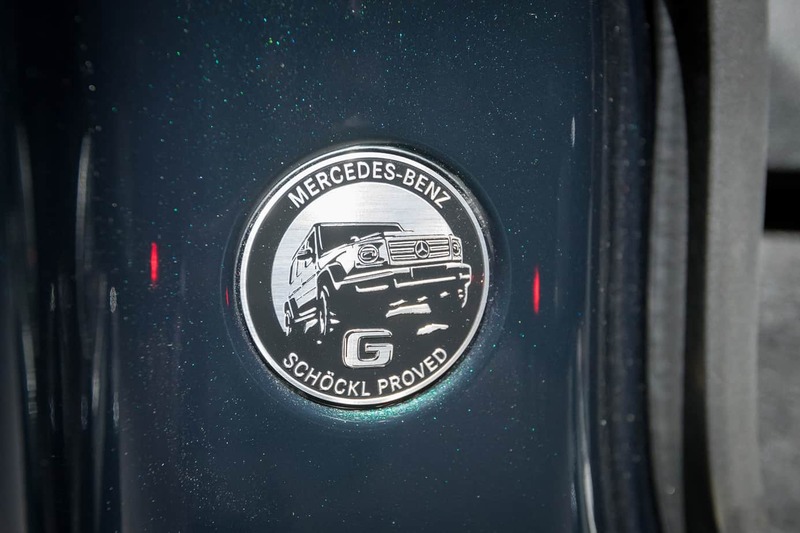 The legendary G-Wagon has been fully brought into the 21st century. Sure, it doesn’t look like the antique square offroader we all know and love, but it still retains the DNA of one of the greatest overland vehicles of all time with over 300,000 units having rolled off the assembly line so far. With a quick glance, it is instantly recognizable as a G, but with a second look, you’ll realize that it is a completely new vehicle. 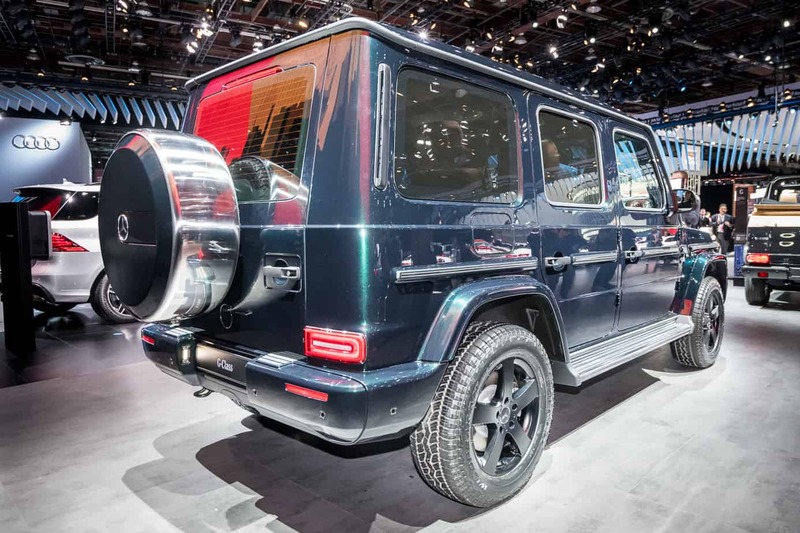 There are a few things, both inside and out, that instantly make this new vehicle recognizable as a G, as well as its classic overall silhouette, of course. Outside, you have prominent indicator lights, exposed hood hinges, exposed door hinges, and a rear-mounted spare tire. 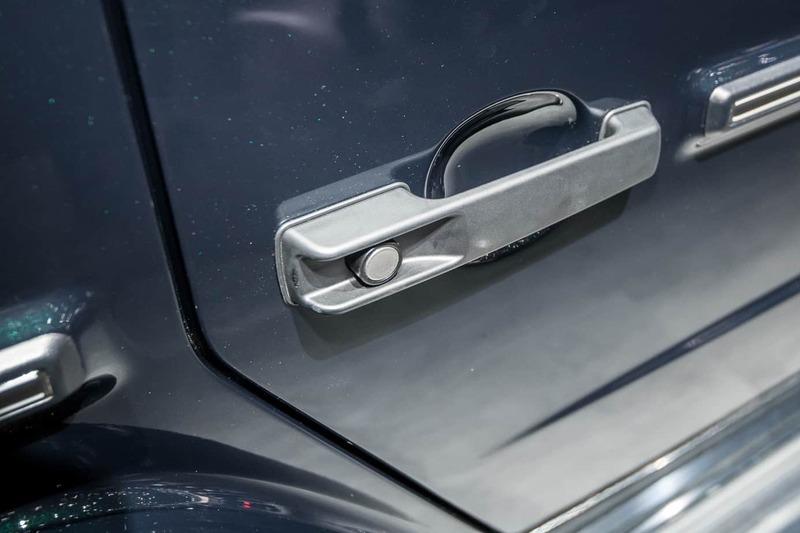 The classic door handles and their solid locking mechanism carry over from the classic G, giving you that characteristic thud as the door closes and locks. Inside, you’ll find the switches for the all-important three locking differentials, and the classic passenger grab handle on the dash remains. Under the hood, you’ll find the familiar 4.0L V8 BiTurbo engine. The first updates you’ll notice are the slightly more aerodynamic shape, and probably the round LED headlamps. The interior has been elevated to all new levels of luxury, which might not bode all that well for the use and abuse of overland travel. It does offer a few inches more elbow room for all passengers and a massive 5.9 inches more legroom for the rear passengers. This all comes from the new G being 2.1 inches longer and 4.8 inches wider than the outgoing model. This adds up to quite a lot more room for the overland interior build-out of your dreams. The elephant in the room, of course, is the big changes under the truck, while still retaining a durable ladder frame. The solid front axle was replaced with an IFS front suspension setup. While diehards will cry about this loss, the reality is that this new setup will probably offer more wheel travel and a much better ride on a wide variety of surfaces. With three locking differentials, capability will surely not be compromised. This new G should be more off-road capable, as it has slightly improved ground clearance (now up to 9.5 inches) and about a degree better entry, breakover, and departure angles. It also offers Dynamic Select driving modes, a similar system to what we’ve all become accustomed to in the Range Rover. The new G also offers up something called G-Mode, an auto activated setting when any locker is in use, or the vehicle is shifted into low range. The onboard computers then change steering, accelerator, damping, and shift points to optimize off-road capability. Sure, many of us will complain about IFS, loads of computer controls, and a price point which is sure to be in the six figures. The reality though is that the new G is even more capable, comfortable, and luxurious than ever. With all that said, long overland journeys to faraway lands are probably best taken in vehicles that can be worked on in the field, and the new G is probably not that vehicle. The much-anticipated return of the Ranger is upon us! The latest iteration of this classic American truck nameplate comes by way of a modified version that has been on offer in Australia since 2011 and available in many other global markets. 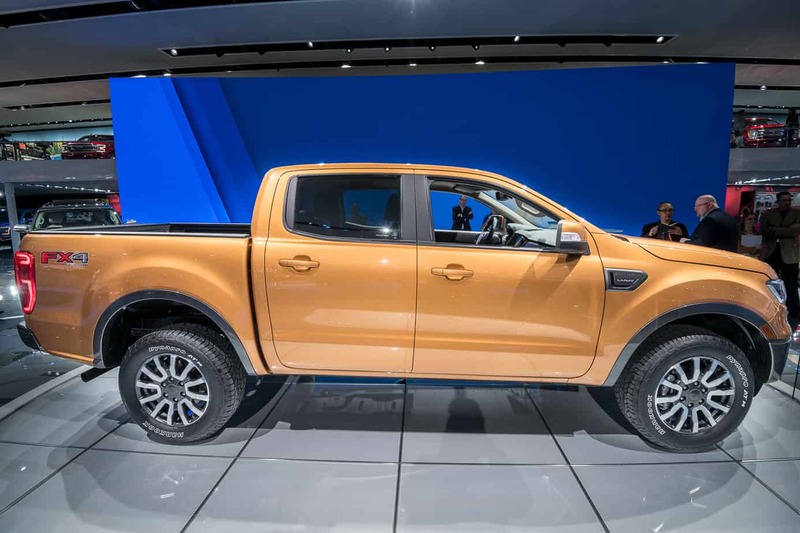 The US Ranger will sport the same platform while being wrapped in all-new steel sheet metal. 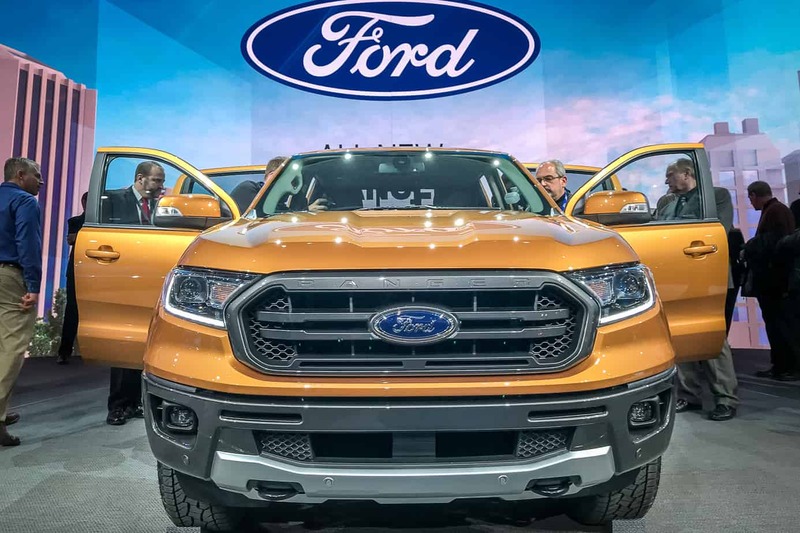 We know a few details now, but there is still a lot that Ford has yet to reveal about this truck. 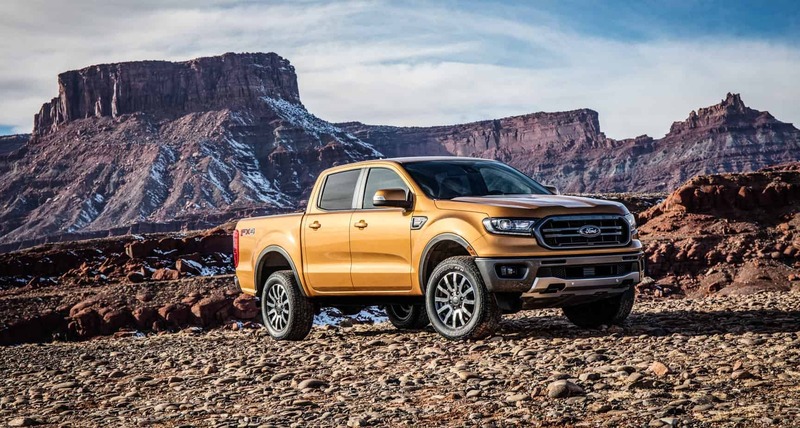 The Ranger will be offered in both SuperCab and SuperCrew configurations, with only one powertrain announced so far: a 2.3L EcoBoost turbocharged 4 cylinder mated to a 10-speed auto transmission. This combo should produce good power and impressive fuel economy, but no numbers have been released yet. A fully boxed high-strength steel frame should hold up to the abuses of proper off-road travel in a loaded overland vehicle and is a much-anticipated feature in the American mid-size truck market. Steel bumpers front and back, both frame mounted, are also a welcome addition and should make adding aftermarket bumpers to the Ranger that much easier. 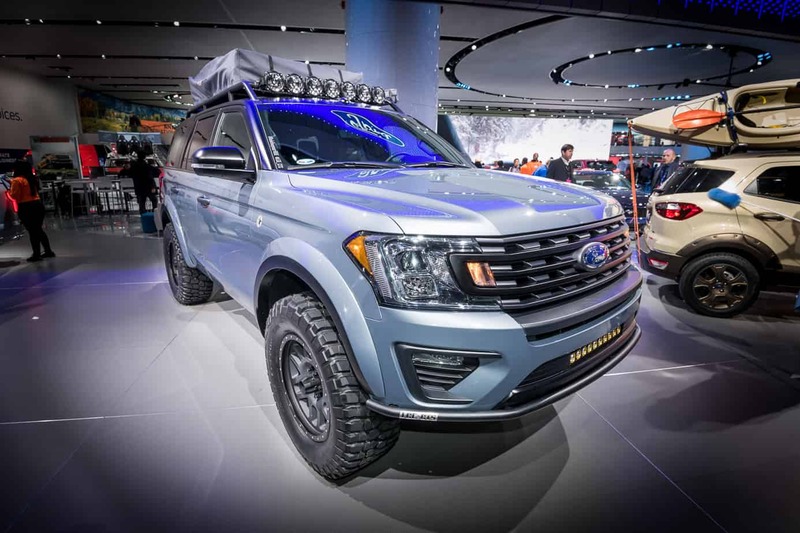 The FX4 off-road package will be popular with the overland traveler, as capability off the showroom floor will be greatly increased over the stock truck. 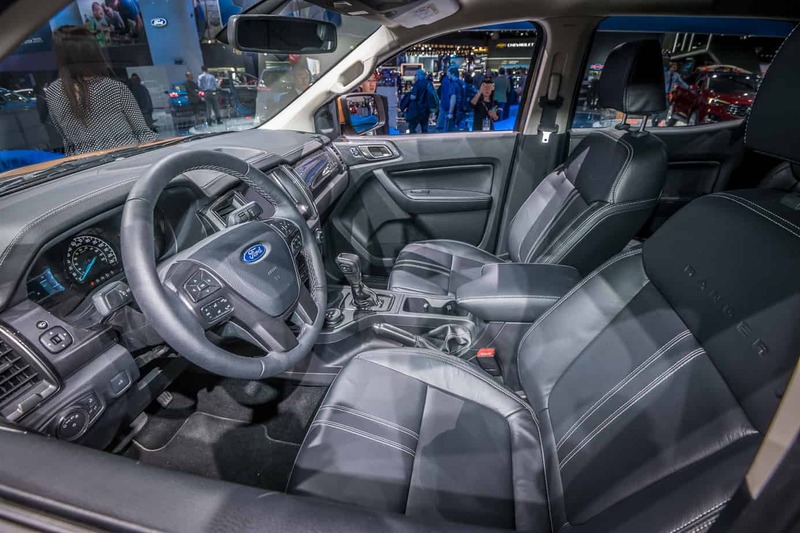 The package offers a rear e-locker, Ford’s Terrain Management System, and Trail Control, which is like cruise control for the trail. I’ll be the first to admit that I’d like to do more than just steer while driving in the backcountry, but I guess TrailControl could help novices forge ahead on their overland journey, even if they don’t have the driving skills to conquer the obstacle in their path. Skid plates improve durability, while an upgraded suspension and AT tires will improve capability and comfort. In all honesty, the interior, while utilitarian, doesn’t really stand out amongst the competition. You will, however, get all the “smart” systems that you’d expect in an all-new modern vehicle: automatic emergency braking, lane keeping assist, lane departure warning, adaptive cruise control, and the SYNC3 infotainment system through the 9-inch touchscreen in the center of the dash, just to name a few. The exterior styling is very Ford and features instantly recognizable LED headlights, impressively sculpted taillights, and a muscular hood. 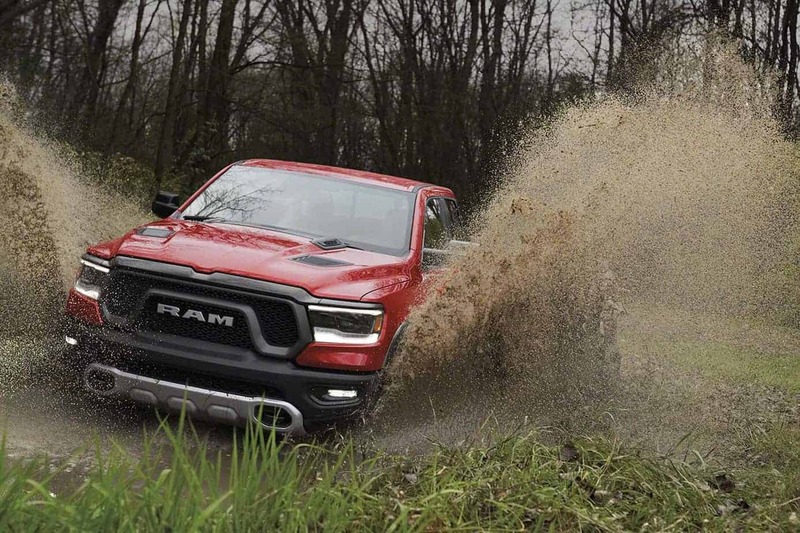 While we wanted desperately to hear about a manual transmission, diesel engine, and a Raptor-like, off-road performance package, we heard none of that. All of those things will probably be coming at some point, along with a Bronco based on the same chassis, but sadly, there is no real info just yet. The full-size, half-ton truck market is heating up. The all-new Silverado was just unveiled, exactly 100 years from Chevy’s first customer truck delivery in January of 1918. 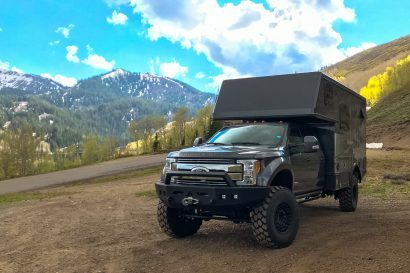 This new bigger, lighter, stronger, more aerodynamic, and technologically advanced truck is sure to impress a lot of buyers and has a lot of upgrades that should make it a great overland build platform. The biggest news is the addition of an all-new 3.0L inline-6 Duramax turbo-diesel, mated to a new 10-speed automatic transmission. This impressive combo is joined by 6.2L and 5.2L V8 petrol options, backed by the same 10-speed transmission, and both with an all-new Dynamic Fuel Management system, which can turn on and off individual cylinders all the time to save fuel, optimize performance, and reduce vibration. With a total of 6 powertrain options available, we are still waiting for word on the other 3 configurations. I’m holding my breath for a manual transmission to go with the new diesel, but I’m pretty sure I’ll pass out before I see that reality. With eight distinct models on offer there should be a Silverado to suit nearly everyone’s taste. A few base models offer a distinctive black “CHEVROLET” stamped grille, basic durable steel wheels, and cloth and vinyl interior options. The Custom Trailboss and LT Trailboss models are what will interest off-road and overland enthusiasts the most. 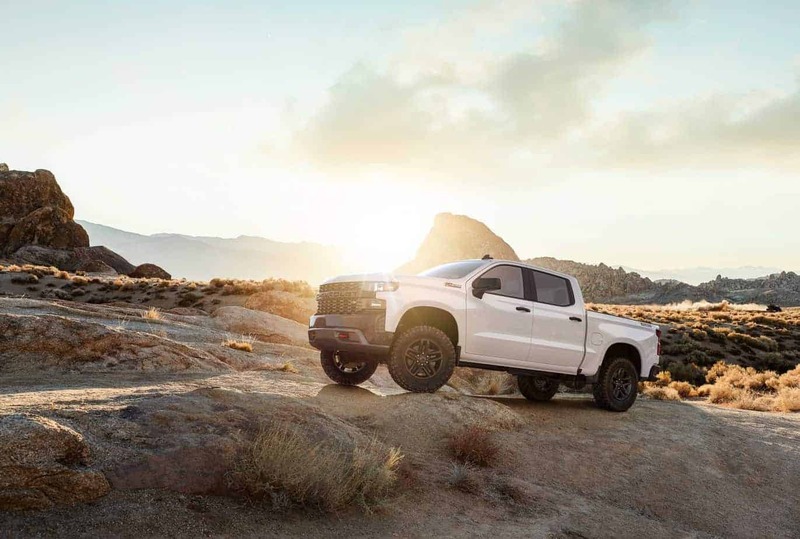 The Trailboss package includes a 2-inch lift, upgraded shocks, a locking rear diff, skid plates, and 18-inch wheels wrapped in 33-inch AT tires. If you order the Custom model with the Trailboss off-road package, you get the clean, black “CHEVROLET” grill and the option of cloth or vinyl interior, which is probably the way I’d order the truck, for value, style, and durability. 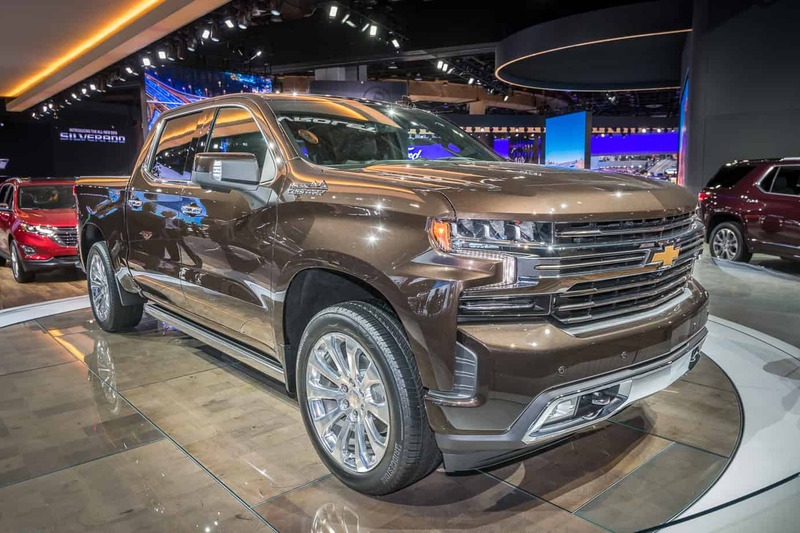 The new Silverado will be an overall bigger truck, which is noticeable in its taller stance, cab, and bed wall height. 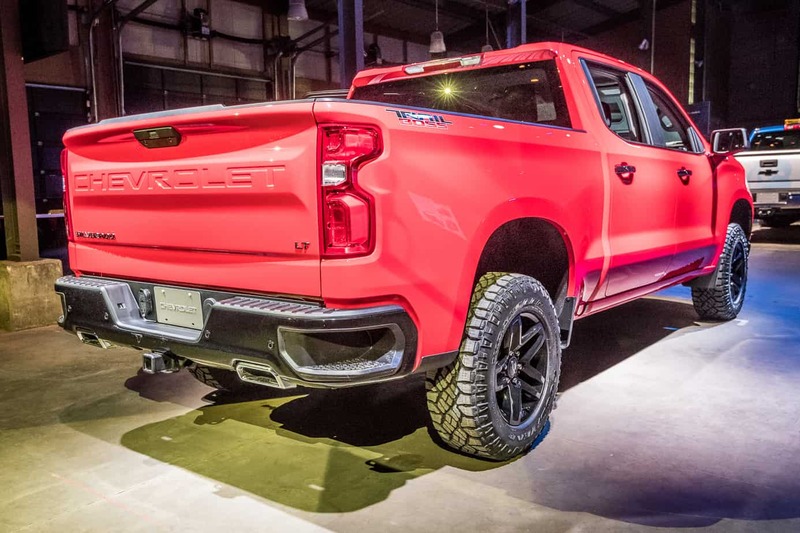 Through the impressive use of mixed materials, Chevy was able to create a more durable, safer, more rigid and lighter truck, up to 450 pounds lighter, even though it is 1.6 inches longer overall. The 3.9-inch longer wheelbase increases the cab volume by quite a bit, which is most noticeable in the improved headroom and rear passenger legroom. Standard 33-inch tires help retain a reasonable breakover angle, even with the longer wheelbase. 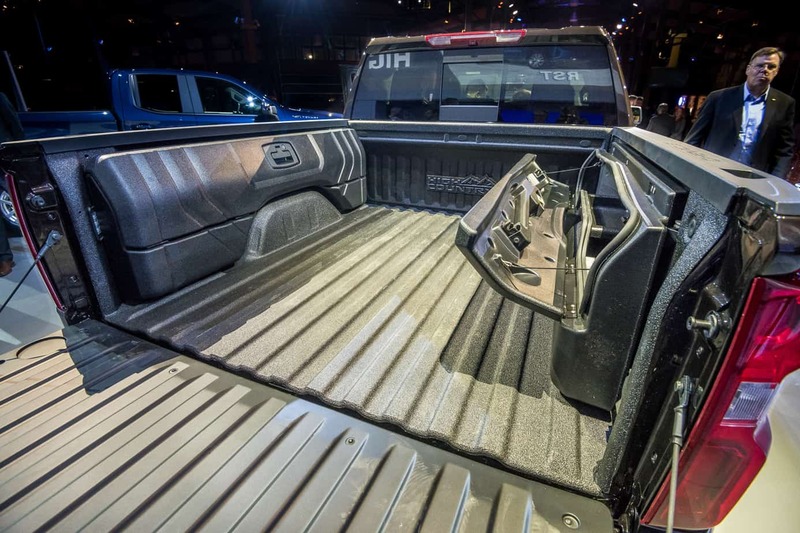 The new Silverado also offers a lot of interior gear storage options, like an under rear seat storage bin and hidden cubbies behind the center cushions in the rear seats. 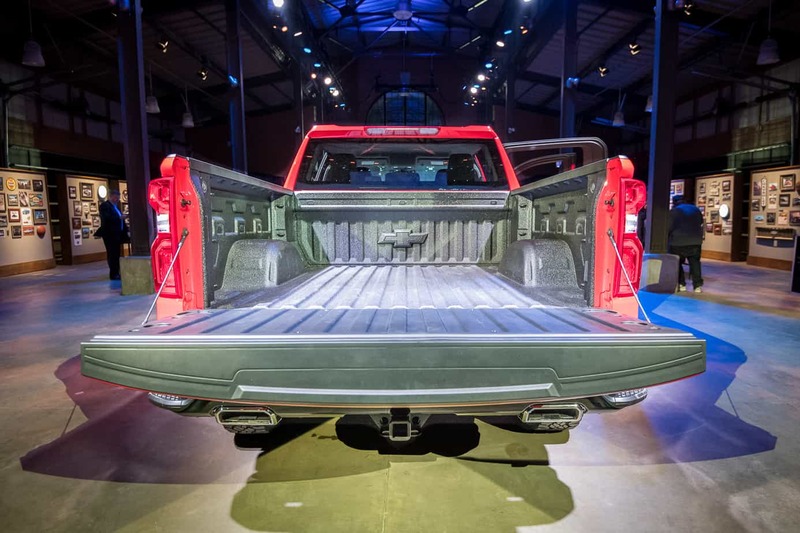 Through the use of a roll-formed higher strength steel truck bed, the new Silverado will offer best in class cargo box volume, a full 63 cubic feet in the short box. With 12 fixed, and up to 9 movable tie downs in the bed, securing your gear should be easier than ever. Integrated task lighting, a 120-volt power outlet, and a powered tailgate take this truck bed to new heights of convenience. 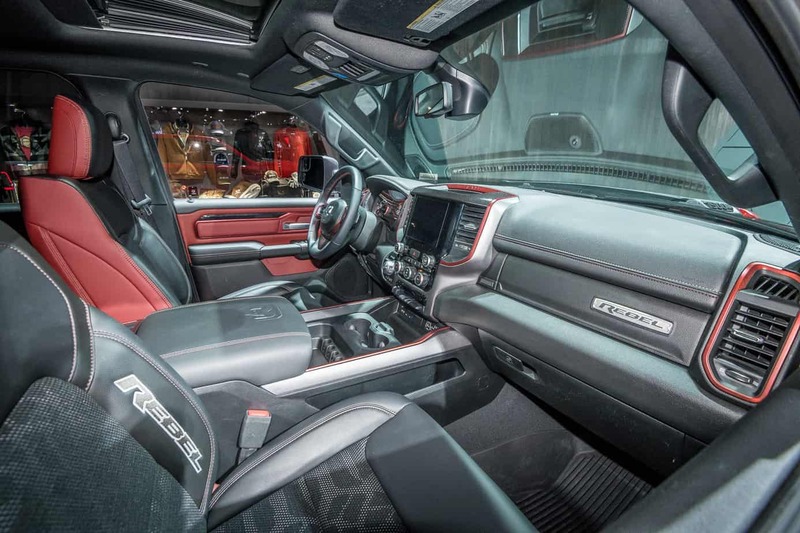 The all-new RAM 1500 will hit the market later this year with a distinctive style and an impressively appointed interior. 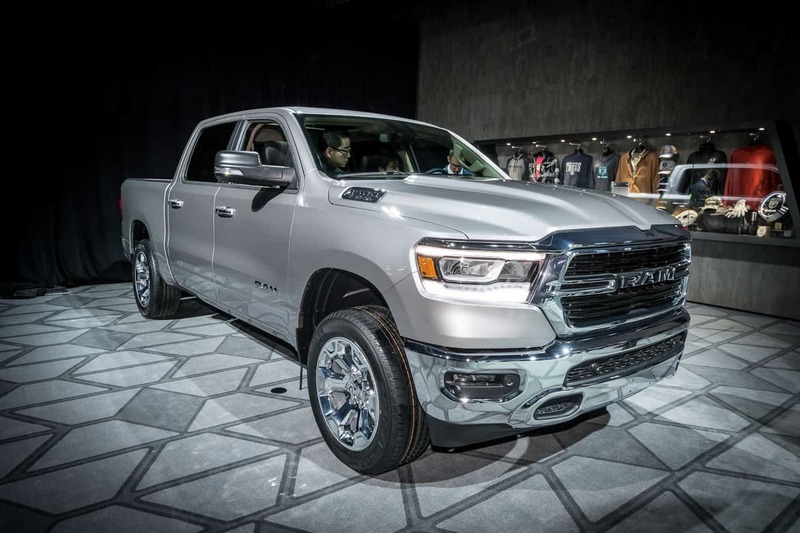 It will also be the most aerodynamic full-size truck on the market and shed about 225 pounds. 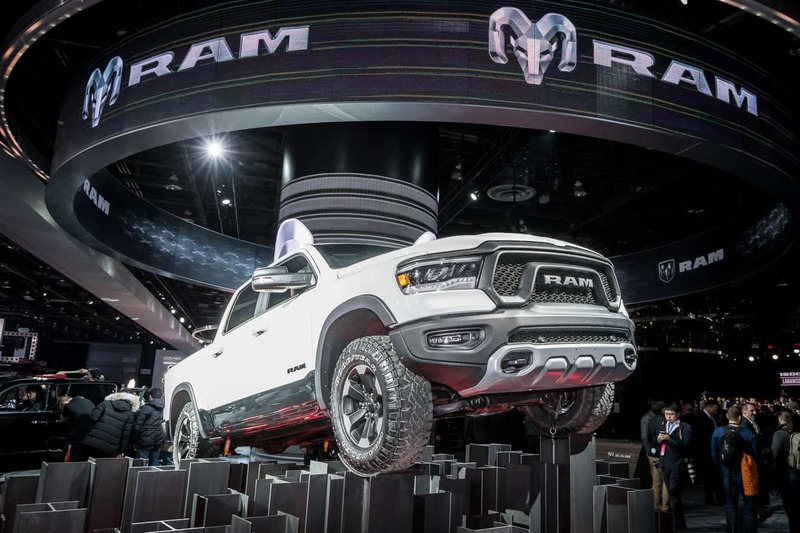 As with all full-size trucks it seems, the RAM will be getting bigger, with a 4-inch longer cab length. 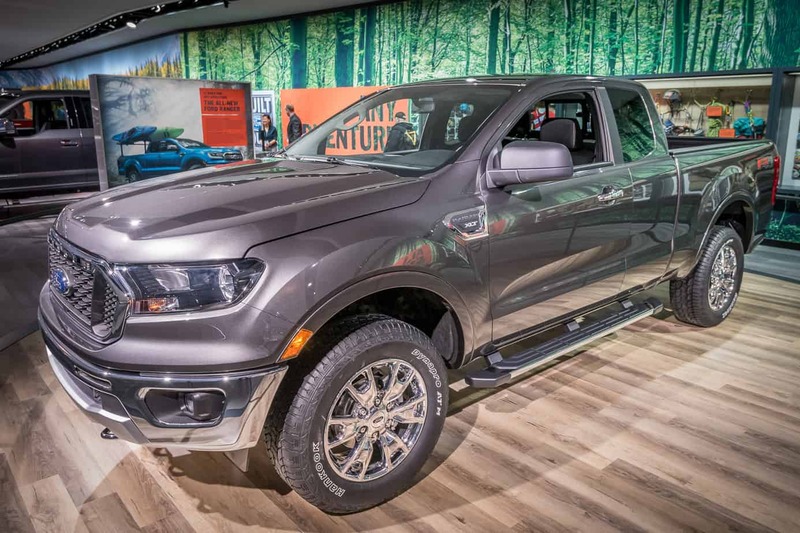 Powering this new truck will be either a 3.6L V6 and 5.7L V8 HEMI, both with a mild hybrid system that promises to add loads of torque at vehicle launch. This feature should improve fuel economy and prove useful in slow-speed, off-road situations. An 8-speed automatic transmission will be fitted to both engines. No diesel announced, but a promise of a new EcoDiesel that will rival the completion was mentioned. 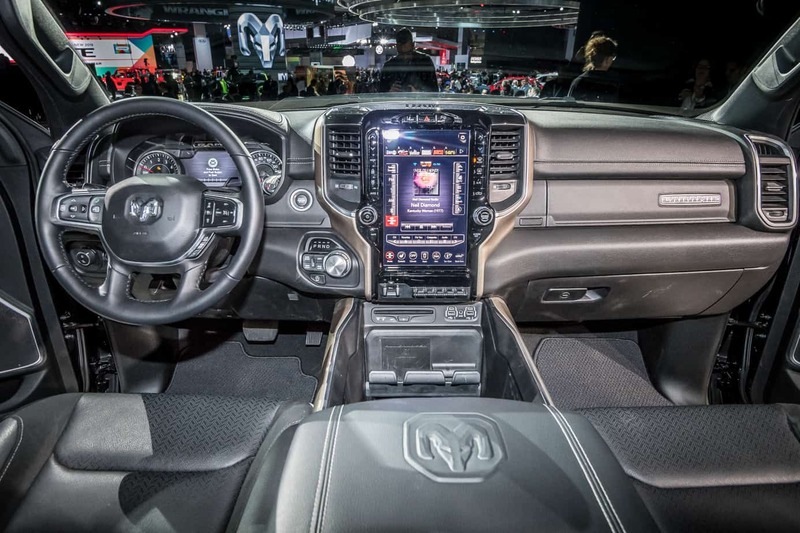 The new RAM is packed full of high-tech features, with a new standard 12-inch touchscreen mounted in the center of the dash being the most noticeable. Safety and driver aids abound: adaptive cruise control, ready alert braking, lane departure warning-plus, and so much more. A massive Harmon Kardon audio system is optional and features 19 speakers, a 900-watt amp, 10-inch sub. A new feature that should prove useful on the trail is a 360-view camera system, which even offers a birds-eye perspective over the vehicle. Comfort and capacity are also improved with the new RAM. It can now haul 2,300 pounds of payload and tow 12,700 pounds. 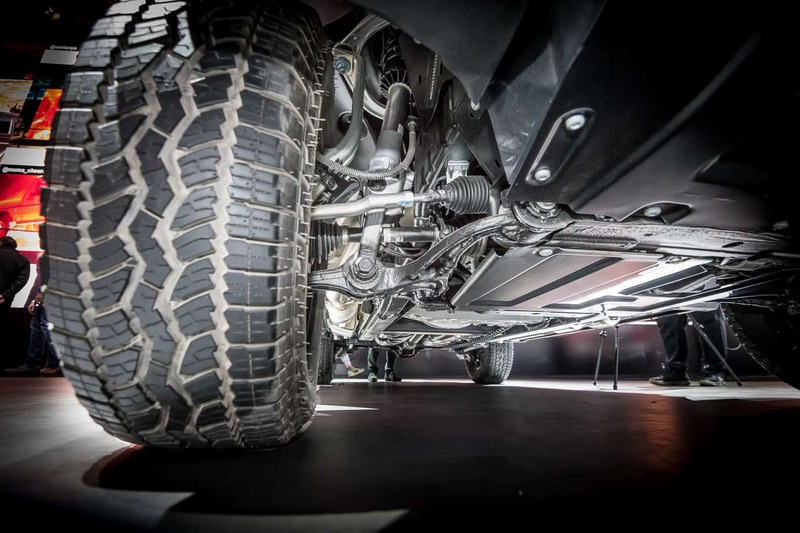 The suspension is also a big story with this truck, as the exclusive five-link coil suspension is said to provide better articulation over obstacles than leaf springs. The other suspension option is a redesigned air suspension setup which promises enhanced economy, improved ride comfort, easier gear loading, and off-road capability. Passenger comfort is improved with a second-row seat that can recline up to 8 degrees. RAM has also fitted this 1500 with a plethora of interior storage cubbies and gear storage options, like the flat rear floor with RamBins and integrated tie-downs. As off-road enthusiasts, we can either choose the off-road package or the Rebel model. The off-road package offers 32-inch AT tires, a 1-inch lift, rear e-locker, tuned shocks, and hill-descent control. The Rebel offers a distinct styling package, 18-inch wheels wrapped in 33-inch DuraTrac AT tires, hill descent control, rear e-locker, tow hooks, full underbody skid plates, and the choice between a 1-inch lift/coil springs/remote reservoir Bilstein shock setup or the available air suspension. 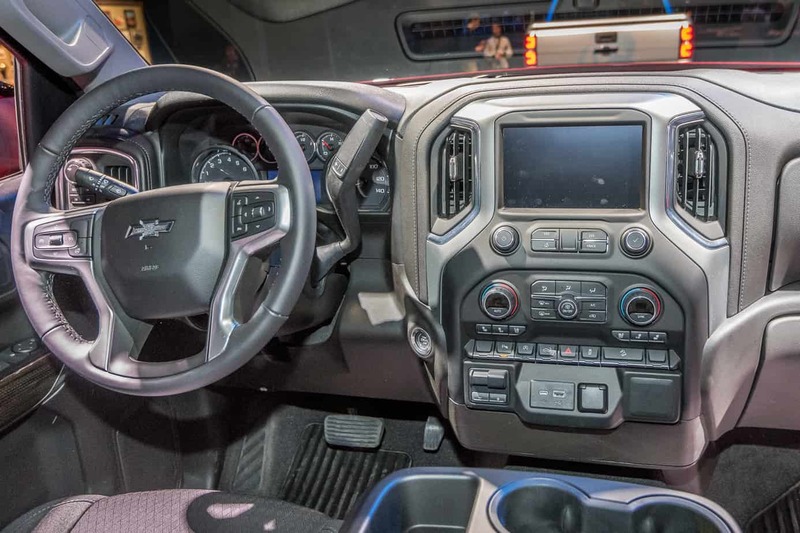 While the new Rebel will also be offered in the QuadCab configuration for the first time, it does not have an option for the new 12-inch touchscreen offered on all other models, and comes with a 9-inch screen only. 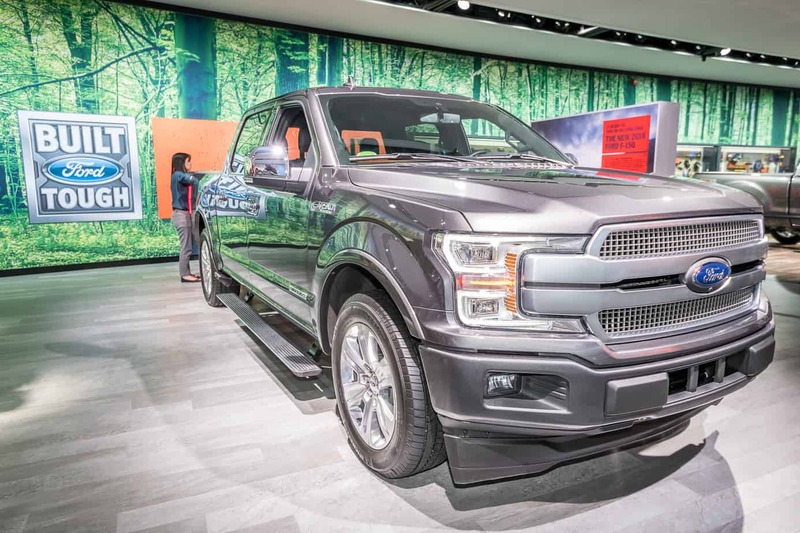 The new F150 diesel will be the first of the new truck offerings to hit the market, although it is just a new engine option and not an all-new truck like the others. Ford did a full refresh of its F150 lineup for the 2018 model year, and it brings diesel power to the best selling truck in America. 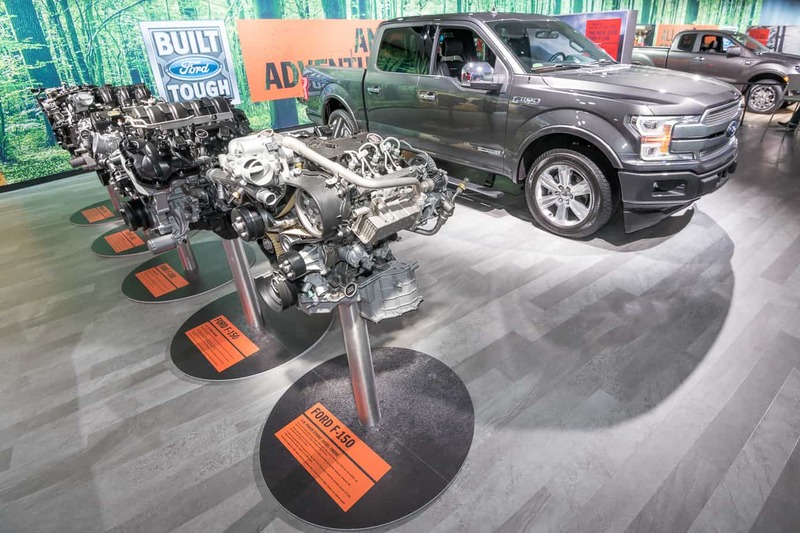 The new 3.0L V6 Power Stroke diesel will net you 30 mpg on the highway and give you 250 horsepower and 440 pound-feet of torque to play with on the trail. With a respectable 2,020-pound load capacity and 11,400-pound towing ability, this truck is plenty adequate for most overland builds. A recalibrated 10-speed automatic transmission with auto start-stop should give you usable power in all terrains while retaining impressive fuel economy. 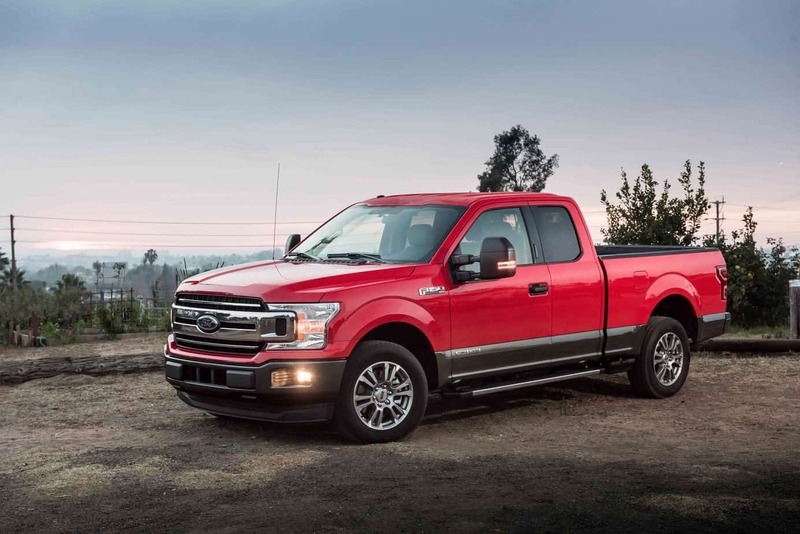 The F150 Diesel will be available on Lariat, King Ranch, and Platinum edition SuperCrew models, with either the 5.5-foot or 6.5-foot beds. It will also be available on the SuperCab models with the 6.5-foot bed. 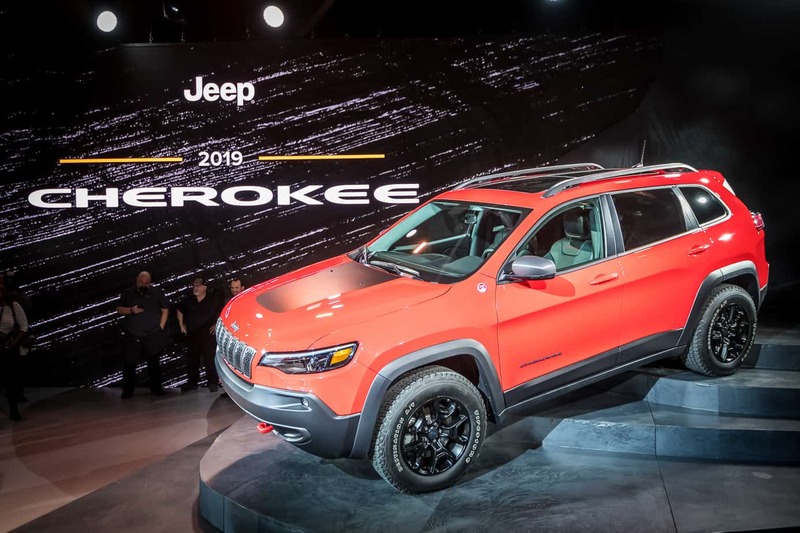 The little Jeep Cherokee is getting bigger, more capable, more refined, and arguably better looking for the 2019 model year, which will be hitting dealer lots very soon. Jeep has labeled it as “The most capable mid-size sport utility vehicle (SUV).” I have to say that it would be REALLY hard to argue against that statement. 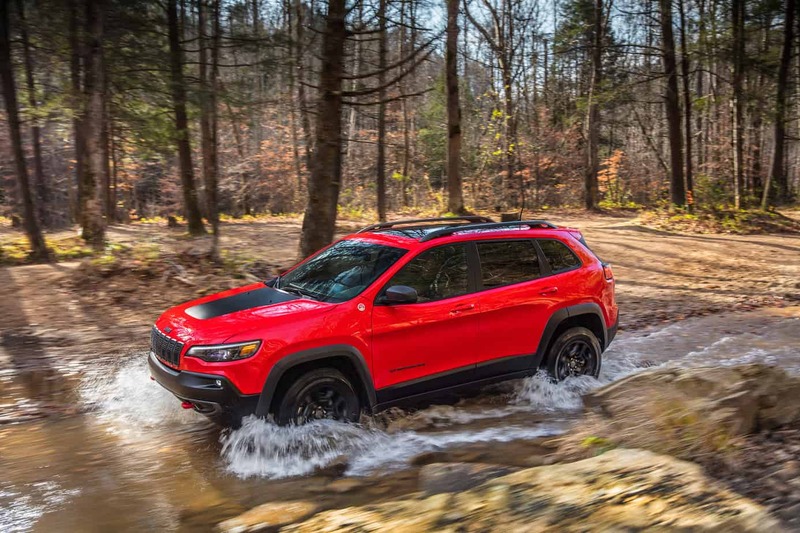 The Trailhawk will, of course, be the flagship Cherokee for off-road adventures. It offers a locking rear differential, proper low range, 51.2:1 crawl ratio, a 1-inch lift, skid plates, signature red tow hooks, Jeep’s Selec-Terrain traction control system, hill–descent control and 17 x 7.5-inch wheels wrapped in 29.5-inch (P245/65R17) Firestone Destination A/T tires. 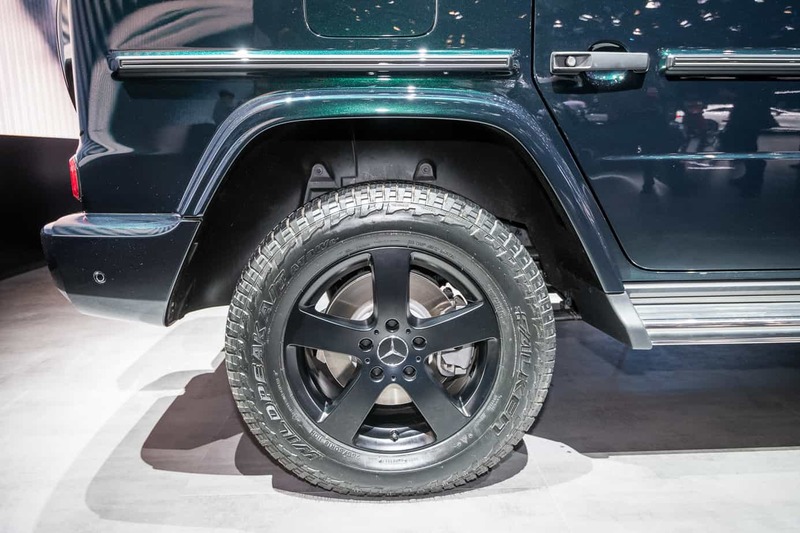 The numbers that matter for off-road vehicles are also pretty impressive for this mid-size SUV: 6.7 inches front and 7.8 inches rear wheel travel, 8.7 inches of ground clearance and 29.9-degree approach/32.2-degree breakover/22.9-degree departure angles. A new 2.0L turbocharged inline 4 cylinder puts out an impressive 270 horsepower and 295 pound feet of torque. It also features engine start-stop technology and is mated to a 9-speed automatic transmission. While this combo should produce good fuel economy and allow towing an impressive 4,000 pounds, it is recommended to feed it premium fuel. Also still available are the 2.4L Tigershark (2,000-pound towing capability) and 3.2L V6 Pentastar (4,500-pound towing capability). With a 15.9-gallon fuel tank, all of these engines should allow for impressively long-range travels. 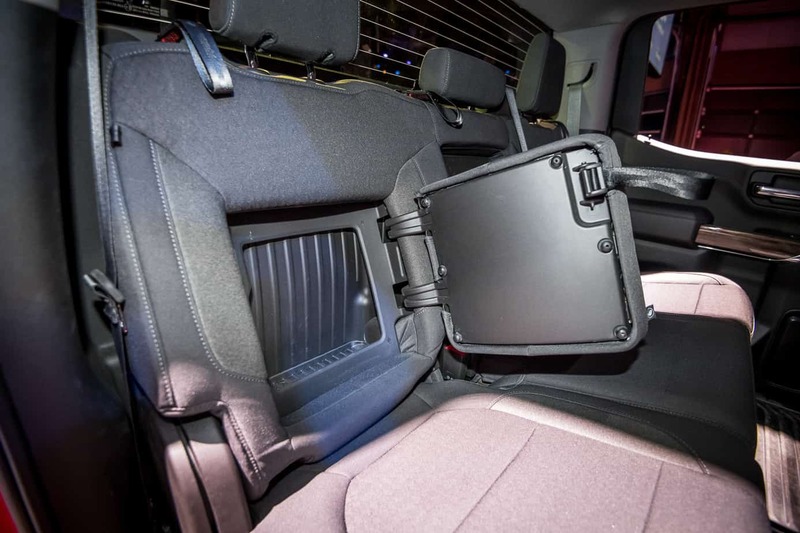 With 1,000 pounds of cargo capacity and more cargo volume (27 cubic feet or up to 54.9 behind front seats with rears folded), this SUV should have plenty of room and capacity for extended journeys. The new sliding rear seats provide more passenger comfort and a decidedly configurable interior. A new powered rear tailgate and 4th-gen Uconnect infotainment system will also make those long journeys more enjoyable. The new electronic power steering should offer big gains in some areas. For off-road travel it allows for a 38-inch turning radius and improves fuel efficiency and power delivery by not robbing engine power for a traditional power steering pump. It also offers Lane Keep Assist and ParkSense park assist, which wouldn’t be possible with a traditional steering setup. 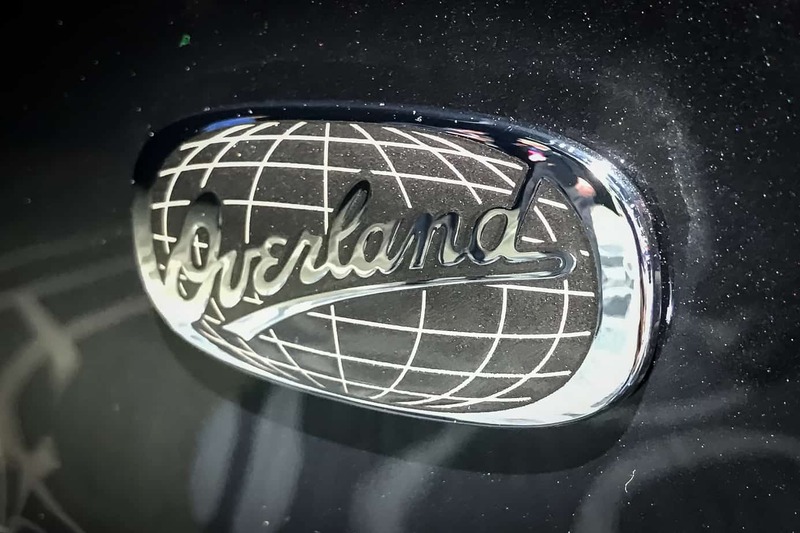 Ironically, the Cherokee “Overland” model is probably the least suited to true overland travel, as it is one of the most luxurious and technology-packed models in the lineup. The Overland badge does look good though. Modified Subarus for overland travel have seen some popularity in recent years, especially because they are great daily drivers, are more capable than you’d first guess, and tend to be a good value for your money. 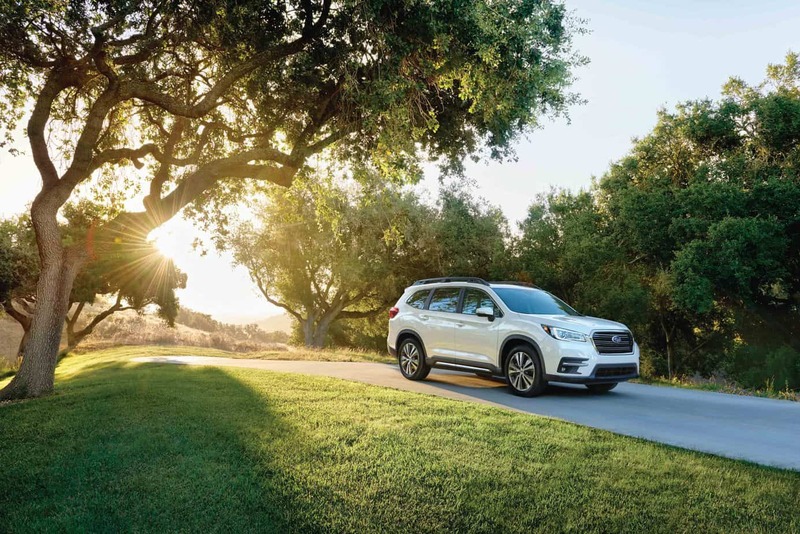 The all-new Subaru Ascent is the largest Subaru ever, offering up 72.6 cubic feet of cargo space and seating for up to eight. A new 2.4L Boxer engine will push 260 horsepower and 277 pound feet through Subaru’s unique Lineartronic CVT transmission. While those numbers aren’t all that impressive for a three-row SUV, they should be plenty for a fun driving experience and quality fuel economy. Driver control is further enhanced with a paddle shift-operated 8-speed manual mode function. 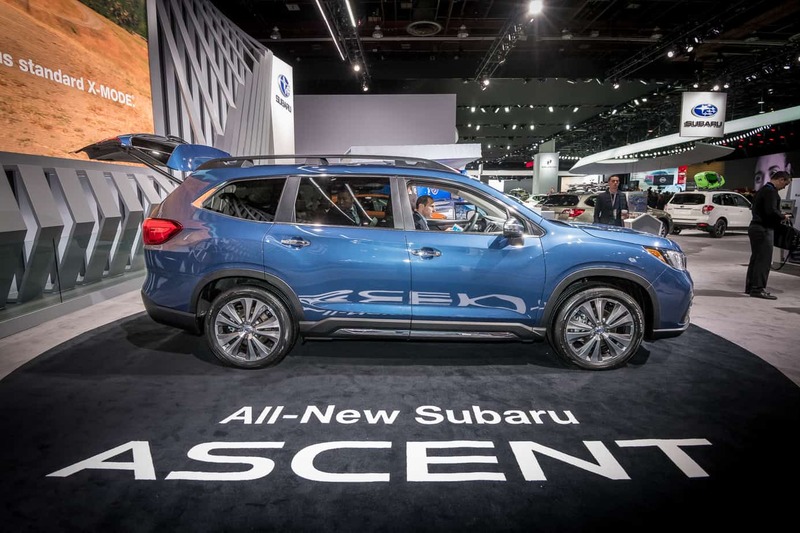 The important things for overland travel with the new Ascent is that it offers 8.7 inches of ground clearance, more than a 500-mile range, symmetric all-wheel drive, and hill descent control. All of these things should make it one of the most capable Subaru’s off the showroom floor ever offered. 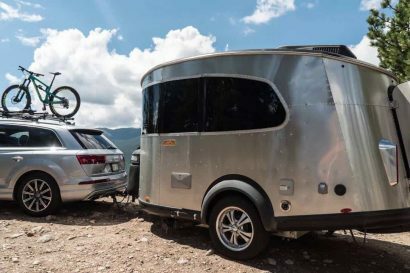 It also has a 5,000-pound towing capacity, which is perfect for snagging that small overland trailer from the driveway after a long work week and heading out on an adventure. The only RTT at the show was on this 2018 Ford Expedition which we first spotted at The SEMA Show. While it’s a clean build, utilizing a bunch of quality ARB accessories, it is built on a 2wd version of the Expedition. Sure you could argue that if you go fast enough you don’t need 4wd in Baja, but that kind of defeats the point of overlanding, especially the part about preserving your vehicle for the long bumpy road ahead.